Karen Garst didn’t intend to become a writer. 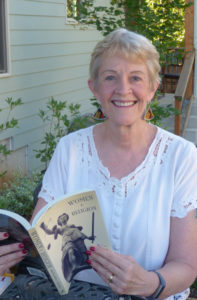 A woman with a diverse academic background – including a Doctorate in Philosophy, a Master’s Degree in French Literature and time spent as a Fulbright Scholar – Garst’s writing career didn’t begin until her retirement. Garst – who moved to Silverton, her “forever home,” in 2016 – hasn’t always considered herself an atheist. Born in Bismarck, North Dakota, Garst grew up in a religious family, was married in the church, baptized her son and attended Concordia College. Garst’s separation from these deep religious roots came about in the 1990s when she began studying the Bible along with over 150 other texts about religion. Women Beyond Belief landed Garst interviews on 50 podcasts and at several national conventions. Garst’s second – and final – book, Women v. Religion: The Case Against Faith – and For Freedom,” which was released in 2018, is a less personal and more historical look at the role of religion in the lives of women from different backgrounds. Both books were written not to persuade women to leave religion, but rather to provide support and historical perspective for women who are interested in enacting change, both in their own lives and in the community around them.